Tuesday 13 November 2012 commencing at 7.00pm. 5143 Prior to the meeting, a presentation was received from representatives of the Neighbourhood Plan Steering Group, regarding the emerging Neighbourhood Plan and options contained within it. All Parish Councillors were invited to attend the presentation and support was given in general to the options presented. Councillors Margaret Duffield, Barbara Hilton and David Hilton. The minutes of the meeting, held on 23 October, were approved as a correct record and signed as such. The Vice-Chairman asked to receive any Declarations of Interest in accordance with the adopted Code of Conduct. Councillor Jeffrey Yong declared a non-pecuniary interest in application 12/02992. Recommendation: No Objections provided that the parking issues could be resolved. Recommendation: No Objections, although the committee requested that the application be referred to the Borough’s Tree Officer to ensure that the proposed re-siting would not be detrimental to the tree root protection zone. Recommendation: Referred to the Borough’s Tree Officer. Recommendation: Objections. The committee considered the application to be out of keeping with the area, which was characterized by detached homes, and therefore contrary to the Townscape Assessment; as well as being damaging to the street scene. The scale, massing and density proposed were considered to be an over-development of the site, contrary to policy H11, with the proportions being contrary to policy H10. Furthermore, the application was considered to be unsustainable in economic, social and environmental respects and therefore contrary to NPPF 7. The parking arrangements, with no visitor parking, and access for service vehicles were considered to be inadequate, with possible highway implications. In addition, the committee considered the application to be contrary to NPPF 9 and 17, in that it did not meet local housing needs, did not reflect the character of the area, did not use land of lesser environmental value and was not located to make fullest possible use of public transport. The committee noted that an archaeological report was outstanding and therefore requested that the determination date only be set once this, and community consultation, had been carried out. The committee also noted that the area was not one identified as being appropriate for apartments within the emerging Neighbourhood Plan. Certificate of lawfulness to determine whether an existing use of the garage as a residential annex is lawful. Recommendation: No Objections, subject to Green Belt Requirements being met. Recommendation: Objections. The committee considered the application to be an overdevelopment of the site which was out of keeping with the character of the area. The proposed dormers would create a two and a half storey dwelling which would be harmful to the street scene along a stretch of road containing two storey dwellings. Concerns were also raised about the removal of the adjacent right of way without prior consultation with neighbours. Display one non-illuminated pole mounted sign. Two storey front extension. Part single storey part two storey front/side extension, conversion of existing garage to family room and demolition of existing conservatory replaced with single storey rear extension. Recommendation: No Objections, although concern was expressed that, if approved, the proposed loss of the garage would set a precedent that would adversely affect a unifying feature of the street scene. Construction of a detached double garage, new side entrance gate and pier. Re-surface and extend driveway. The appeal will be decided on the basis of Written Representations. Comments are to be received by the Planning Inspectorate no later than 13 November 2012.
landing over, partial conversion of existing double garage to form habitable accommodation. garage with first floor storage over, following the demolition of the existing house and garage. New entrance gate and walls. Proposal: Two storey part single storey side and rear extension and alterations. and erect four detached 4 bed houses with garages, access drives and associated works. Proposal: T1 Sweet Chestnut, fell. and photovoltaic panels on the roof of the existing sports centre. Councillor Peter Deason informed the committee of a meeting he attended with the Borough and Councillor Peter Comber, regarding the parking arrangements along Queen’s Road, and within Queen’s Road and Bowden Road car parks, in Sunninghill. It was agreed that this matter be considered at the next Parish Council committee, to be held on 4 December. There being no further business, the Vice- Chairman closed the meeting at 8.28pm. Tuesday 23 October 2012 commencing at 7.00pm. The minutes of the meeting, held on 2 October, were approved as a correct record and signed as such. The Chairman asked to receive any Declarations of Interest in accordance with the adopted Code of Conduct. Councillor David Hilton stated that as a substitute on the Windsor Rural Development Control Panel any views given on applications are on the basis of information available to date and he would review the position when all the information was available at the meeting when the decision is made. Recommendation: Objections. The committee welcomed three residents from Wellswood who raised objections to the application. These objections coincided with those raised by the SPAE representative. Although the committee recognised that attempts had been made to reduce the impact on neighbouring properties, this had resulted in ‘front loading’ the development which had resulted in an ‘urbanising’ effect. The resultant overdevelopment of the site was therefore contrary to the Townscape Assessment (which defined the area as one of ‘villas in a woodland setting’) and thus out of keeping with the character of the area. In addition, the loss of 6 category B trees was considered to be damaging to the street scene, further exacerbated by the proposed access road, which was considered to be inadequate for service vehicles. Combined with the proposed parking arrangements, the committee raised concerns about highway safety implications and considered the proposal to be contrary to the NPPF. The degree of sustainability was also questioned, as was the consideration of affordable housing on site. Furthermore, the potential loss of privacy and light for neighbouring properties, due to the proximity and design of the proposed plots, was considered harmful to neighbourhood amenity; as was the view from the south east of the site. Lastly, the committee were concerned that if this application were approved it would set an unwelcome precedent and did not mirror that of Wellswood. No Recommendation Required: The committee questioned whether planning permission should be sought for such an extensive proposal. Recommendation: Objections. The garage proposed at 2.5m wide is below the Borough’s width standard and would result in a loss of a parking space. The committee also sought re-assurance that there would be no breach of the 45 degree rule. Recommendation: No Objections, subject to a condition that adequate sound insulation be included in the conversion so that the current use of the adjacent garage could continue. Recommendation: No Objections as the committee considered this to be a duplicate of an approved application (12/02158), as it failed to make clear the differences. Two storey front bay extension. New front porch. Single storey rear extension. Alterations to main roof to infill. Pitched roofs over existing front bay windows. Two front entrance gates. Recommendation: No objections, although the committee asked that the application be referred to the Borough’s highway officers regarding access. Recommendation: Strong Objections. The committee expressed concern that an increasing number of applications to fell protected trees were being received following the building of new developments close to trees , rather than for sound arboricultural reasons. The original application for Apartment 11 had been approved subject to no tree loss. The committee asked that the application be referred to the Borough’s tree officer and that it be called into the Development Control Panel, should the Borough be minded to approve it. Recommendation: Objections on the grounds of loss of parking space due to the unique position of this property within the street. The committee requested that the Borough obtain a parking plan for the application, prior to determination, and that this plan be made available on the planning portal website. The development proposed was a part 1st floor and part 2 storey side extension plus single storey extension and new roof over existing conservatory. side of crown. T2 – Walnut – Tip back branches which are extending over the garage, by up to 1.5m. floor extension and roof terrace above. Loft conversion with rear dormer window. side wall, windows and doors. accommodation above, and new access ontoHeathfield Avenue. crossover, following demolition of existing dwellings. Councillor David Hilton was asked to check if this Condition was for the latest application for the site. The Clerk reminded the committee about the forthcoming Public Meeting on a ‘Vision for the Future of Ascot Centre’, to be held on Monday 29 October, from 7.00pm – 9.00pm at the Pavilion, Ascot Racecourse. Councillor David Hilton stated that he would circulate, via the Clerk, a document regarding the performance of the Borough’s Planning Department. The minutes of the meeting, held on 21 August, were approved as a correct record and signed as such. Recommendation: Objections. The committee considered the reasons for refusing the original application still applied, as set out in the attached statement below. Furthermore, the proposal was not considered to be sustainable and therefore the presumption in favour of development should not apply. Concern about the impact on the tree root protection zone and the tree canopy were also expressed. Recommendation: Objections. The committee considered the proposal to be contrary to policy GB2 as it was an intensification of use within the Green Belt. Furthermore, the height and scale of the building, potential light pollution, tree loss and traffic movement would adversely affect neighbourhood amenity. If the Borough were minded to approve the application, the committee requested that conditions be imposed for the whole site regarding opening times, screening and floodlight usage outside of school hours. Recommendation: Objections. The committee considered the proposal to be contrary to policy H14 as it was damaging to the street scene. The properties within this stretch of Gainsborough Drive were built with symmetrical sloping roofs which have not been altered. This application would result in cutting into the roof which would set an unwelcome precedent. The proximity of the two storey extension was considered to be too close to the boundary, at less than 1metre, and would create a terracing effect. Furthermore, the loss of light would be unneighbourly and the proposed guttering could be contrary to building regulations. The committee requested that the application be bought to the Development Control Panel, should the Borough be minded to approve it. Recommendation: Objections. The proposal was considered to be ‘backland’ development and of a significantly greater scale than the neighbouring properties development. Concerns were also expressed regarding the tree root protection zone, the impact on the street scene, as the entire footprint would be moved forward, and that the proposed drive would cause inconvenience to the neighbours. The committee requested that the application be bought to the Development Control Panel, should the Borough be minded to approve it. Certificate of lawfulness to determine whether a proposed single storey side extension is lawful. Recommendation: Objections. The garage was considered to be too high and wrongly located. The proposed garage would adversely affect the street scene, as would the white rendered perimeter wall, and was too close to the tree canopy. Change of use from Wine Shop (A1) to Wine/Cocktail bar (A4), including new shop front. Recommendation: No Objections, subject to a specific floor area being set aside for retail use. Recommendation: Objections. The committee considered that the same grounds for objection to application 12/01441 still existed as the changes contained were not significant. The proposal therefore still considered to be an overdevelopment of the site and would thus have an adverse affect on the street scene. Plot 2 was considered to be too close to 2 Lower Village Road and Plot 1 could possibly overlook 22 Oriental Road and would therefore be unneighbourly. Furthermore, concerns about the impact on the tree root protection zone of plot 2 and tree canopy were raised. extensions, raising of roof to provide loft accommodation with rear dormers and a side chimney. accommodation above, and new access onto Heathfield Avenue. The proposed LapLand UK application in Swinley Forest was discussed. The extended consultation period was noted and Parish Councillors were asked to inform residents of this. Councillor Peter Deason expressed concern about the Government’s proposed relaxation of planning conditions relating to household and retail permissions, which he considered to be contrary to the Localism agenda. Councillor David Hilton agreed to write to the Member of Parliament for Windsor raising these concerns, which were shared by the Committee. 1. 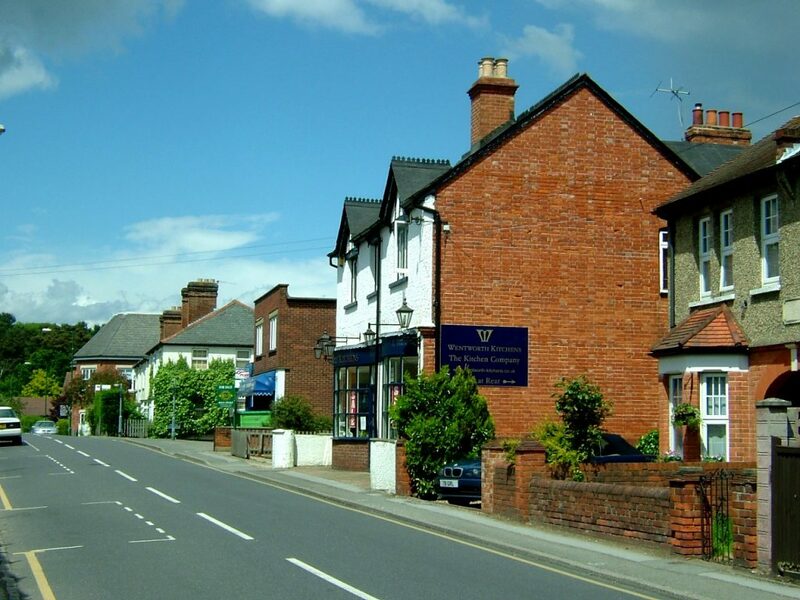 The development is not in harmony with the character of the local area as defined in the borough’s Townscape Character Assessment, contrary to policy 58 of the NPPF and to the communities’ strong desire to retain the local character and its concerns regarding the increasing density of developments. The density of development, at 43 homes per hectare compared with the current figure of 3.5/hectare reinforces the view that the development is out of character and of too high a density for its location. The development adversely affects the street scene, reduces the green and leafy appearance and introduces an urbanising appearance, contrary to the community wishes. • The trees along the Wells Lane frontage will need to be replaced. • The ramp to the basement conflicts with the RPA of an important tree on the western side. • There is no tree survey and no tree protection measures are proposed. The location of the development is not considered sustainable, contrary to the requirements of the NPPF policies 17, 30, 35 and 37. Section 6.9 of the Design and Access statement claims the development is in a sustainable location with easy access to local facilities and amenities, and 4.6 of the D&A statement states that in the design there is an emphasis on pedestrian, mobility impaired, cycle and public transport over car travel. These statements are clearly not correct as the station is 1.5km away, the nearest bus stop is 1.1 km away, the nearest convenience store is 0.8 km away and the nearest primary school is 1.3 km away. The committee further noted that there are no footways in Wells Lane, and no footpath on the south side of the London road. The development is therefore not sustainable for vulnerable pedestrians. The SPA is still constraining local housing numbers. Tuesday 31 July 2012 commencing at 7.00pm. Councillors Peter Deason, David Hilton and Daniel Whittall. The minutes of the meeting, held on 10 July, were approved as a correct record and signed as such. Recommendation: Objections. The committee considered that there were no arboricultural reasons and this application should be rejected. Should the proposed Burnside development be approved it would seriously affect the amenity of immediate neighbours in Blythwood as their screening would be reduced. Construction of detached dwelling with integral double garage and rooms in the roof space, following demolition of existing. Recommendation: No Objections, provided that the Borough’s Tree Officer ensured that the root protection zone of the trees would not be adversely affected as the proposal would result in a larger footprint. Recommendation: No Objections, provided that the conditions attached to the previous application, 11/02241, still applied. Recommendation: Objections. The committee considered the proposed dwelling to be excessive in bulk and scale. Thus it would be damaging to the street scene and intrusive. As the proposal was a re-submission which moved the dwelling further toward a known badger set, the committee considered it essential that a report be obtained from the Borough’s retained ecological consultant. If the Borough were minded to approve the application, the committee requested that it be called in to the Rural Development Control Panel. Recommendation: No Objections, although the committee requested that a demolition and construction statement be provided due to the nature of the road. Recommendation: Concerns were expressed that the raising of the roof height by 1metre would affect the roof alignment of adjacent properties and therefore the symmetry of the street scene. The committee requested that if the Borough were minded to approve the application, a condition be imposed that ensured the roof tiles harmonised with the adjacent properties in colour and material. Recommendation: Referred to the Borough’s Tree Officer, provided sound arboricultural reasons were given. Recommendation: Objections. The committee considered that the reasons for refusal at appeal of the previous application, 01/08354, still applied, particularly as the proposal was for higher houses which would be more intrusive. The proposal was considered to be harmful to the street scene, neighbourhood amenity and would create a terracing affect. Therefore it would be contrary to the Townscape Assessment which defined the area as one of ‘villas in a woodland setting’. Construction of seven detached dwellings and a new access road. The Planning Inspectorate has informed us that a date and venue has been confirmed for the appeal. The Hearing will take place at 10.00am on 18 September at Desborough Suite, Town Hall, Maidenhead. panels on the roof of the existing sports centre. Proposal: Single storey rear extension following demolition of existing outhouse. Fitting an enlarged front window. classroom facilities whilst works are completed. with accommodation above, and new access onto Heathfield Avenue. window up on the East elevation. A general discussion regarding the viability and diversity of the retail outlets within Ascot high Street followed the committee meeting. There being no further business, the Chairman closed the meeting at 7.50pm. Minutes of a meeting of the Planning Committee held at the Ascot Day Centre,Bagshot Road, Sunninghill on Tuesday 10 July 2012 commencing at 7.00pm. Councillors Barbara Hilton, David Hilton and Jeffrey Yong. Mr. Peter Standley from SPAE. The minutes of the meeting, held on 18 June, were approved as an accurate record and signed as such. Recommendation: No Objections, subject to securing the root protection zone of adjacent trees. T1 Beech, crown reduce by 25%. T2 Beech, fell or reduce by 25%. T3 Beech, reduce over extended limbs and deadwood. T4 Beech, fell. T6 Beech, reduce by 15-20% and remove dieback in upper crown. T8 Beech, deadwood. T11 Beech, reduce by 20% and remove die back. T12 Beech, reduce secondary stem to lower branches. Recommendation: Objections. The committee requested that T4 Beech only be felled if it were dead, dying or dangerous. Recommendation: No Objections, subject to a condition being imposed that the garage doors were retained to preserve the street scene, if the Borough were minded to approve the application. Recommendation: No Objections, subject to the ownership of the land being clarified, and any related covenants regarding the protection of the property, being conformed to. Recommendation: Objections. The committee considered the proposed fence to be contrary to Policy H14 as it would create a tunnelling effect and be damaging to the street scene. If the Borough were minded to approve the fence, the committee requested that it be sited deeper into the site so as to be less obtrusive to the street scene. The committee further requested that the Highway Officer be satisfied that the proposed gates complied with relevant regulations. Recommendation: The committee considered that prior approval should be required and that an alternative siting should be submitted, due to the Highway implications of the proposal. Recommendation: Strong Objections – please see attached statement. Alterations and extensions including single storey rear, first floor front and two storey part first floor side extensions and open front porch and flue for stove. Recommendation: The committee raised objections to the proposed two storey extension as it was within 1metre of the footpath of the adjacent property. Councillor Margaret Duffield raised concerns about the extent of tree felling within the Hurstleigh Development inSouth Ascot. The Clerk was asked to raise this with the Borough’s Tree Officer. There being no further business, the Chairman closed the meeting at 7.53pm. 1. The development is not in harmony with the character of the local area as defined in the borough’s Townscape Character Assessment, contrary to policy 58 of the NPPF and to the communities’ strong desire to retain the local character and its concerns regarding the increasing density of developments. The density of development, at 43 homes per hectare compared with the current figure of 3.5/hectare reinforces the view that the development is out of character and of too high a density for its location. The trees along theWells Lanefrontage will need to be replaced. The ramp to the basement conflicts with the RPA of an important tree on the western side. There is no tree survey and no tree protection measures are proposed. The location of the development is not considered sustainable, contrary to the requirements of the NPPF policies 17, 30, 35 and 37. Section 6.9 of the Design and Access statement claims the development is in a sustainable location with easy access to local facilities and amenities, and 4.6 of the D&A statement states that in the design there is an emphasis on pedestrian, mobility impaired, cycle and public transport over car travel. These statements are clearly not correct as the station is 1.5km away, the nearest bus stop is 1.1 km away, the nearest convenience store is 0.8 km away and the nearest primary school is 1.3 km away. The committee further noted that there are no footways inWells Lane, and no footpath on the south side of theLondon road. The development is therefore not sustainable for vulnerable pedestrians. Monday 18 June 2012 commencing at 7.00pm. Councillors Peter Deason,, Margaret Duffield and David Hilton. The minutes of the meeting, held on 29 May 2012, were approved as a correct record and signed as such. Councillor Barbara Story declared a non-pecuniary interest in application 12/01532. Recommendation: Objections. The proposal was considered to be an overdevelopment of the site and would therefore have an adverse affect on the street scene. Plot 2 was considered to be too close to 2 Lower Village Road and Plot 1 could possibly overlook 22 Oriental Road and would therefore be unneighbourly. Recommendation: Objections. The committee were concerned that the proposed 5.2m clearance was too high and that the Borough’s Tree Officer needed to be satisfied that there were sound arboricultural reasons. Recommendation: No supporting documentation was available from which to comment. Recommendation: Objections. The committee considered the proposal to contain inadequate parking arrangements. Recommendation: Objections unless sound arboricultural reasons were given. Recommendation: Objections One reason for refusal given at the appeal of the previous application, 10/01275, was still valid. The proposal would have an adverse impact upon the character of the area and was therefore contrary to the Townscape Assessment and Policy H11. Recommendation: The committee were unable to comment as the plans submitted were unclear and inadequate. The committee requested that the plans be re-submitted and referred to the Borough’s Highway Department, so that they could be satisfied that the proposal met the relevant standards. and new off site footpath along coronation road. The Chairman informed the committee of an additional Council Meeting to be held on Tuesday 3 July at 7.00pm at the Ascot Day Centre. In conjunction with Sunningdale Parish Council, a presentation would be received on the results of the Neighbourhood Plan consultation. She also informed the committee of a proposed meeting with the Borough’s Head of Planning and Development, the Chairman of the Windsor Rural Development Control Panel, herself and Councillor Peter Deason. Concerns would be raised regarding the Development Control Panel’s consideration of the Beechcroft development in Sunninghill. She summarised these concerns, which would be expressed on behalf of the Parish Council. Tuesday 29 May 2012 commencing at 7.00pm. In attendance: Elizabeth Yates, Clerk to the Council and Peter Standley, SPAE. The minutes of the meeting, held on 8 May 2012, were approved as a correct record and signed as such. Councillor Peter Deason declared a non-pecuniary interest in application 12/01385. Recommendation: Objections. The committee considered the proposal to be excessive in scale and bulk. Therefore it was out of keeping with the street scene H11 and contrary to the Townscape Assessment. Recommendation: No Objections provided the Borough’s Tree Officer was satisfied. Recommendation: Objections. The committee considered the aggregate affect of four properties in a row was out of keeping with the area, would adversely affect the street scene and was therefore contrary to the Townscape Assessment. The proposal was considered to be cramped, dominant and represent an overdevelopment of the site. It would result in the loss of boundary greenery in an area that backed onto the Green Belt. Furthermore the committee considered the entrance onto the site to be dangerous and would not allow for adequate emergency and service vehicle access. The proposed drive was over the root protection zone of protected trees and no tree report had been submitted with the application. Recommendation: Referred to the Borough’s Tree Officer, although the committee requested that sound arboriculture reasons be given for any tree works. Recommendation: No Objections provided that the revised condition must be complied with. Recommendation: No Objections provided that the balconies would not overlook neighbouring properties. Recommendation: Referred to the Borough’s Tree Officer, although the committee noted that a number of trees had been removed and that a sound arboriculture reason should be given for any further tree works. Recommendation: Objections. The front dormers were not considered in keeping with the street scene as defined within the townscape assessment. The Planning Inspectorate has informed that the Hearing will take place at 10.00am on 20 June at the Main Chamber, Guildhall, Windsor. Outline application with some matters reserved for the construction of a detached house with associated parking and access together with a replacement garage for 10 Fox Covert Close. The Planning Inspectorate has informed that the appeal will be decided on the basis of written representations. Proposal: Fell two Oak trees (T1 and T2). Fell one Scots Pine (T3) and Fell one Silver Birch (T4). wing. Amendments to some side and rear fenestration. New gates and Piers. Councillor Peter Deason raised concerns that Condition 5 had not been complied with regarding application 11/03194 (Briar Coombe, St Marys Hill, Ascot). The Chairman stated that she would advise the Borough’s Planning Department regarding this matter. The Clerk informed the committee that the next Planning Committee was to be held on Monday 18 June, because of Royal Ascot week. There being no further business, the meeting closed at 7.50pm. Tuesday 8 May 2012 commencing at 7.00pm. The minutes of the meeting, held on 17 April 2012, were approved as a correct record and signed as such. Councillor Robert Ellison declared a prejudicial interest regarding application 12/01096 and was therefore not present during the consideration of that application. Recommendation: The committee considered that they were not able to consider the application as the proposed elevations had not been made available and that the external consultation should begin when these additional drawings and related information was available. Recommendation: Objections. The committee considered the proposed signs to be too large and therefore out of keeping with the street scene. They asked that further information be given before the Borough made a determination, such as the colour of the sign and it’s wording, and that if the Borough were minded to approve, a condition be imposed that limited the duration of the display of the signs, to a couple of days before the event, and that the signs be taken down the day after the event. Recommendation: Objection on the same grounds as for application 11/02422. These being that the proposal was thought to be unneighbourly, cramped and with inadequate parking and limited access for service vehicles. The general servicing of the building raised concerns. The committee went on to request a condition ensuring that the external lighting faced inwards should the Borough be minded to approve the application and that the visibility splays and road safety issues be referred to the Borough’s Highways Officer. Recommendation: Objections. The committee considered that the change of access did not meet the Borough’s requirements for visibility splays and that the Highway Officers report should therefore be supported. Recommendation: Objections. The committee requested that the Borough’s Tree Officer’s report be accepted. Recommendation: The committee raised concerns about the stability of the adjacent boundary onto the London Road should the demolition commence. They requested that the Borough’s Highway Officer considered this concern and that Section 106 funding be sought to ensure the safety and structural stability of the boundary. The committee requested that no demolition commenced before the end of the nesting season and that a wildlife survey was conducted prior to the Borough’s consideration of the application. A management plan for the demolition was also requested prior to approval. Recommendation: No Objections although the committee requested that if the Borough were minded to approve the application, a condition was imposed that ensured that there was no damage to the hedge at the rear of the property. Recommendation: The committee identified discrepancies in the drawings submitted within the application, regarding that approved in application 09/00271 and that shown in application 12/01160. Therefore they were not able to consider the application. The committee requested that the external consultation should begin once these discrepancies had been clarified. Councillor David Hilton stated that he would raise this matter with the Borough. The appeal will be decided on the basis of a Hearing. The Chairman informed the committee that she would be writing a letter of objection to the Planning Inspector on behalf of the Parish Council. landscaping following demolition of existing pair of attached dwellings. annexe and a green Sedum roof. garage roofspace) with new access and gates. Proposal: Fell 1 Beech tree to ground level. Proposal: Refurbishment and ground and first floor extensions to provide new kitchen and dining facilities. 11/00164 to add an air conditioning unit the garage with a 1.8m acoustic screen. The Chairman informed the committee of SPAE’s AGM on Thursday 24 May, at 7.30pm, at Ascot Racecourse. Peter Standley asked for clarification regarding the parking arrangements at Queens Road Car Park in Sunninghill. Councillor David Hilton raised a matter regarding residents parking in Queens Road, Sunninghill. There being no further business, the meeting closed at 8.10pm. Tuesday 20 March 2012 commencing at 7.00pm. Councillors Margaret Duffield, Robert Ellison and Daniel Whittall. The minutes of the meeting, held on 28 February 2012, were approved as a correct record and signed as such. 12/00455 (Full) Land at Rustlings and Kingsland, London Road, AscotErection of two blocks of 5 apartments with associated works following demolition of existing dwellingsRecommendation: Objections. The committee considered that the objections given to the previous application 08/00871 remained in place as the new application was not substantially different; objections that had been upheld at appeal and related to the inappropriate size, scale, layout and sitting of the proposal. Additional concerns were also raised regarding the inadequacy of the parking allocation, particularly for visitor and service vehicles in an area where on street parking was not available, the refuse collection arrangements and the lack of emergency vehicle access. 12/00486(Works To Trees Covered by TPO) Cedar House, Coombe Lane, Ascot SL5 7ATTo reduce the overhang of a Hornbeam by approximately 10%. To reduce one low large south facing limb of an Oak tree by approximately 3 metres. To lift a large Cedar in the back garden removing 7 lowest limbsRecommendation: Referred to the Borough’s Tree Officer. 12/00514 (Full) St Marys School, St Marys Road, Ascot, SL5 9JFNew 400m all weather track and hockey pitch with floodlights and fencing. Ancillary store and control hut. Photophotiac panels to roof of sports centreRecommendation: Objections- see attached statement. Councillor David Hilton was asked to call the application into the Development Control Panel. 12/00515 (Full) St Marys School, St Marys Road, Ascot, SL5 9JFRefurbishment and ground and first floor extensions to provide new kitchen and dining facilities. Refurbishment and two storey, part single storey extension to former concert hall to form a two storey library and new terrace. Temporary kitchen/ dining and classroom facilities whilst works are completedRecommendation: No Objections, provided that the totality of development was not disproportionate within the Green Belt and that no harm to trees resulted from the development. 12/00529 (Works to Trees Covered by TPO) Southgate, Hurstwood, Ascot, SL5 9SPFell two Oak trees (T1 and T2). Fell one Scots Pine (T3) and fell one Silver Birch (T4).Recommendation: Objections as no sound arboriculture reasons had been given. The committee requested that the Borough’s Tree Officer attention be drawn to the application. 12/ 00533 (Variation) The Bothy and Land Adjacent to the Bothy and Woolaway Cottage, Wells Lane, AscotTo either discharge the planning obligation made in 1986 for the whole site outlined in blue on the accompanying map or a modification to release the part of the site outlined in red on the accompanying map in connection with planning permission 11/03164 (to erect four detached 4 bed houses with garages, access drives and associated worksRecommendation: The development to which this planning permission relates shall not be implemented if any part of the development approved under application reference 09/02191 has been implemented, nor shall the development permitted under application reference 09/02191 be implemented if any part of the development to which this planning permission relates has been implemented. 12/00536 (Full) 16 Victoria Road, Ascot, SL5 9DATwo storey rear extensionRecommendation: No Objections. 12/00557 ((Works to Trees Covered by TPO) Oakhampton, Burleigh Road, Ascot, SL5 8EST2 Oak, remove north limb. T3 Oak, raise crown to give clearance over roofsRecommendation: Referred to the Borough’s Tree Officer. 12/00594 (Full) 30 Armitage Court, Ascot, SL5 9TAPart first floor part two storey side extension with a single storey rear extensionRecommendation: No Objections provided the proposal was not harmful to the amenity of neighbouring properties. 12/00597(Cert of Lawfulness of Proposed Dev) 19 Elizabeth Gardens Ascot SL5 9BJCertificate of Lawfulness to determine whether a proposed two storey, part single storey rear extension and front canopy is lawfulNo Recommendation Required. 12/00599 (Cert of Lawfulness of Proposed Dev) 6 Charters Cottages, Charters Lane, Ascot, SL5 9NUCertificate of Lawfulness to determine whether an existing conservatory is lawfulNo Recommendation Required. 12/00618 (Full) 7 Regents Walk, Ascot, SL5 9JQConstruction of a replacement detached house and garage (with ancillary accommodation in garage roofspace) with new access and gatesRecommendation: No Objections. 12/00625 (Full) Evergreens, The Avenue, Ascot, SL5 7LYConstruction of a detached single storey annexe. Amendment to 11/01340 to extend the annexe and a green Sedum roofRecommendation: No Objections, as long as the proposed annexe was ancillary to the family home. The committee requested that if the Borough were minded to approve the application, a single family occupancy condition was imposed. 12/00636 (Full) Lorien, 14 Vernon Drive, Ascot, SL5 8TWTwo storey, part single storey and single storey rear extensions. Replacement front claddingRecommendation: No Objections provided the proposal was not harmful to the amenity of neighbouring properties. the wording ‘no development shall take place until’ from each condition. The committee objected to the amendment which was considered to be contrary to policy N7. The committee raised no objections to the amendment. There being no further business, the meeting closed at 8.12pm. The committee considered that the scale, increased intensity and visibility of use involved brought the proposal into conflict with GB policy GB2(B). This is a Green Belt site surrounded by residential developments and with a common boundary with the busy Coronation Road. GB policy allows under GB1 permission for essential facilities for outdoor sport but under policy GB2 does not permit developments which would either have a greater impact on the openness of a site than the existing or a material intensification of existing levels of activity. The committee considered the scale and intensification of the proposals would have a harmful impact on the openness of the Green Belt and failed to meet the criteria in GB2 to allow permission to be granted. This was due to the increase in facilities proposed levels of use which was not just to create facilities within the school boundary which pupils have at present to go off site for, but to attract other schools and clubs etc to use this Green Belt site. Additionally the committee considered the extent and duration of floodlighting, noise from spectators and vehicle movements to be harmful to the amenity of neighbouring residents. These concerns applied to the upgrading of the existing hockey pitch which had been restricted by conditions to 99/78056 (9-6pm, no Sunday use and no lighting) which the applicant now asked to be removed.